Do not have time going to the gym to build muscles? Don’t care about it! I will show the best weight bench exercises at home to have a full body workout. A bench and a pair of hand weights are enough to have complete strength training. If you do not have the equipment yet, I recommend you to get and an adjustable workout bench and a pair of adjustable dumbbells. Therefore, you can do even more types of exercises and variations, plus you can save money and space. But, a flat weight bench and traditional dumbbells will do as well. I group the exercises based on muscle groups. These practices are suitable for both beginners and advanced fitness level athletes. 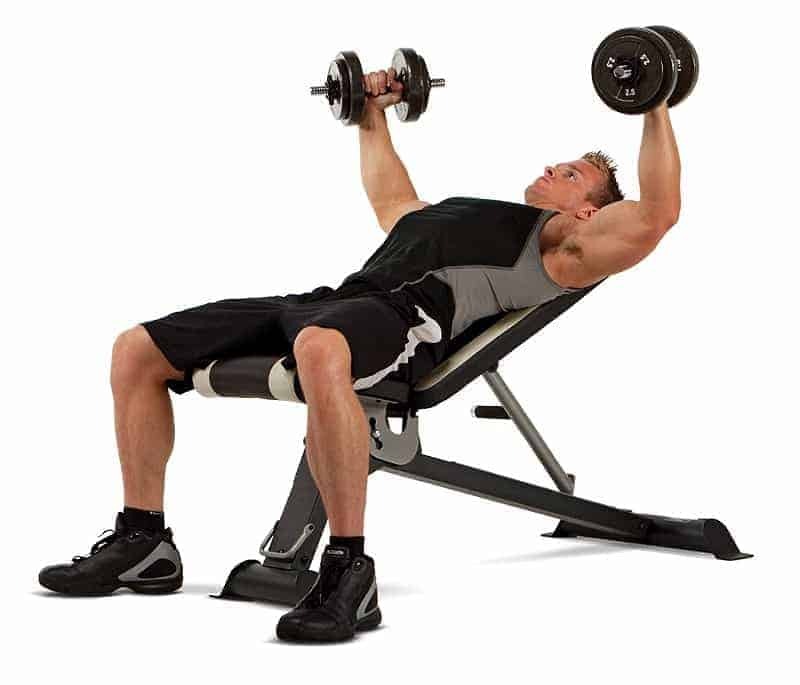 The most beneficial chest exercises are the flat, incline and decline bench presses. They are great for developing the size and strength of our pecs. Chest flys are great for widening and stretching the pectoralis. Finally, I have to mention the push-ups (regular, decline, incline). The following video is an excellent example of a chest workout at home. Seated or standing shoulder presses, and lateral and front raises are the winners here. Perfect drills for strength and size. 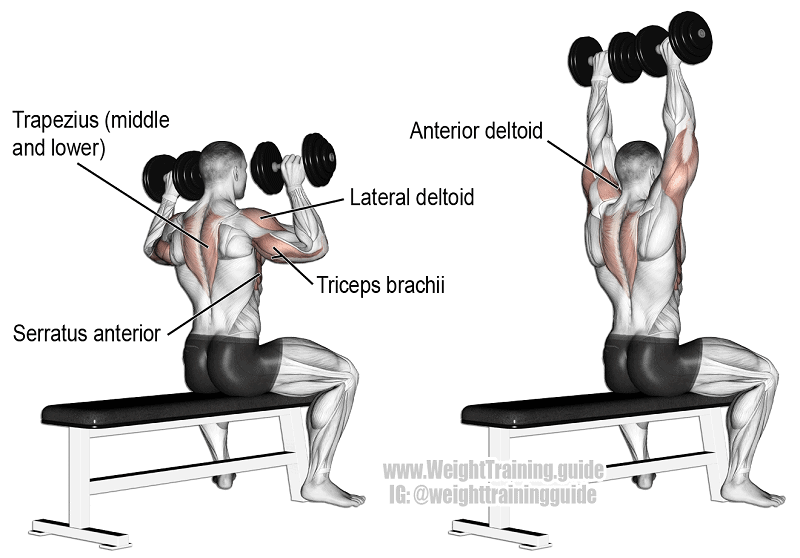 However, I have to mention the Arnold press which is a fantastic compound exercise for the delts. You can do various dumbbell rows. There are single or two hand versions, even ones even chest supported versions. Hence, you can target every part of your back. You can also do reverse hyperextension with the help of a flat bench to strengthen your lower back and muscles next to your spine. Well, squats and lunges with dumbbells are the winner here for which you do not need a bench. Although, there are other powerful moves: Bulgarian split squat, step ups and supported pistol squats. These are single limb drills, so they require existing strength. Beginners better do them without weight first. Also, some equipment comes with leg curl and extension attachment to have an even more complete leg weight training at home with bench. In my opinion dumbbells are the best exercise equipment for arms training. Curls in seated or standing positions are great for developing the biceps. 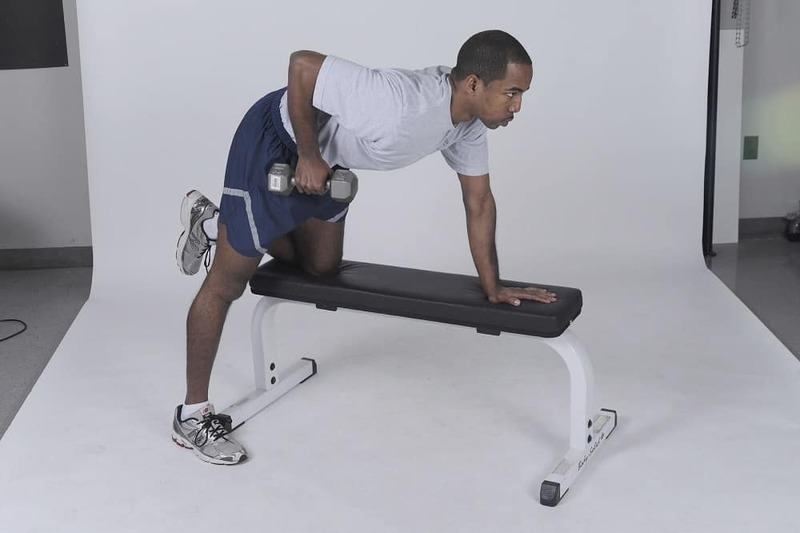 For triceps, bench dips are excellent strength training exercises. But, you can do seated, standing or lying triceps extensions as well. Some items come with a leg hold attachment so that you can do sit-ups or crunches. If not, you can use the equipment to do leg raises, knee-ins and many other hand and feet elevated weight bench exercises for abs. Do not want to do just bench exercises with dumbbells? 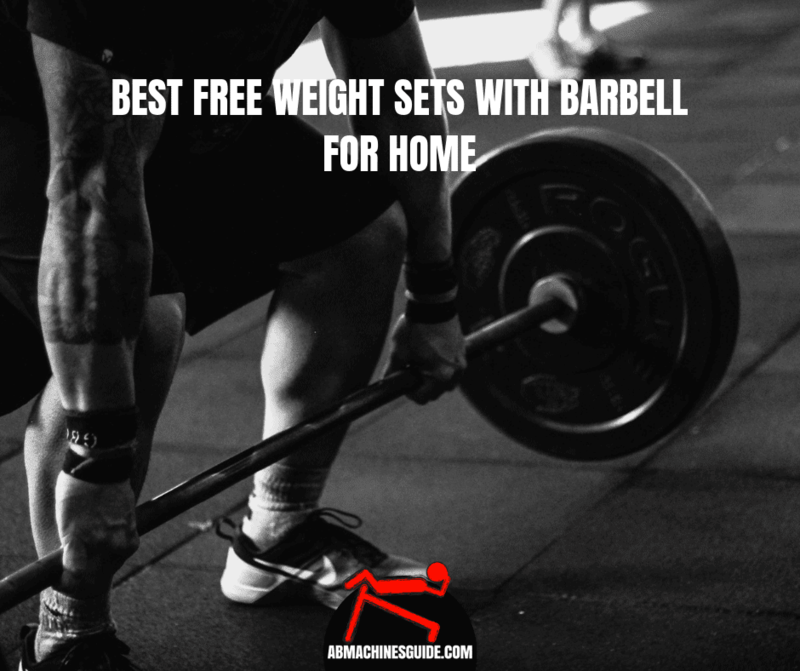 Well, there a lot of other weight bench workouts at home for which you use your bodyweight. On top of that, there many cardio types of moves which are excellent to burn body fat and develops your endurance. 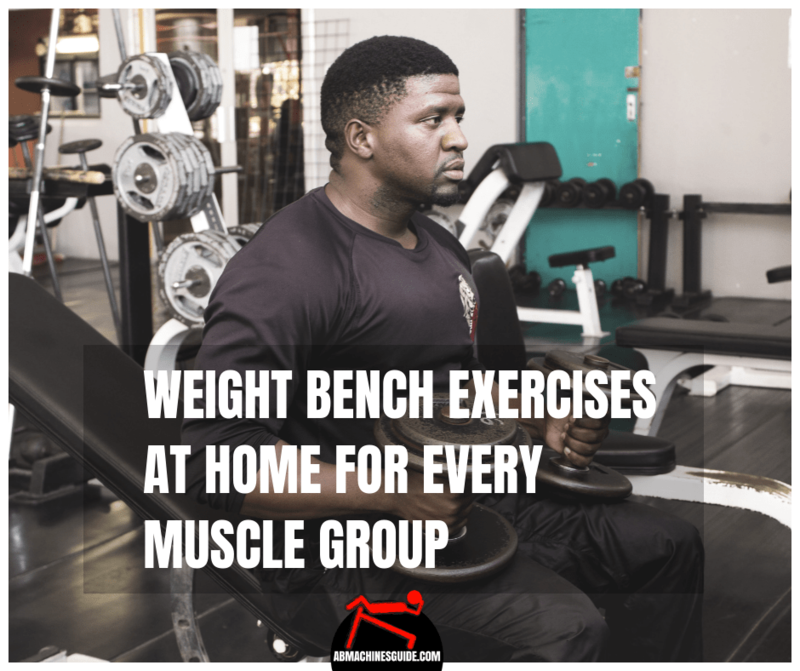 You have learned many exercises, so the next step is the create an at home bench workout routine. If you are a beginner, I recommend you to have a full body workout 3 times a week instead of a split training. That means you strengthen every main muscle groups during a session. For big muscles like chest, leg and back get 2-3 exercises. For small muscles like biceps, triceps, abs, and shoulders so 1-2 exercises. Since you are a beginner, do 2-3 sets and 10-12 reps.
Of course, as you get better, you can increase the resistance, reps, and sets. However, always focus on the correct performance of the exercises. As you see there are many weight bench exercises at home to have a full body training. I know a gym seems to be a much better option, but if you try these moves, you will see how effective they are.